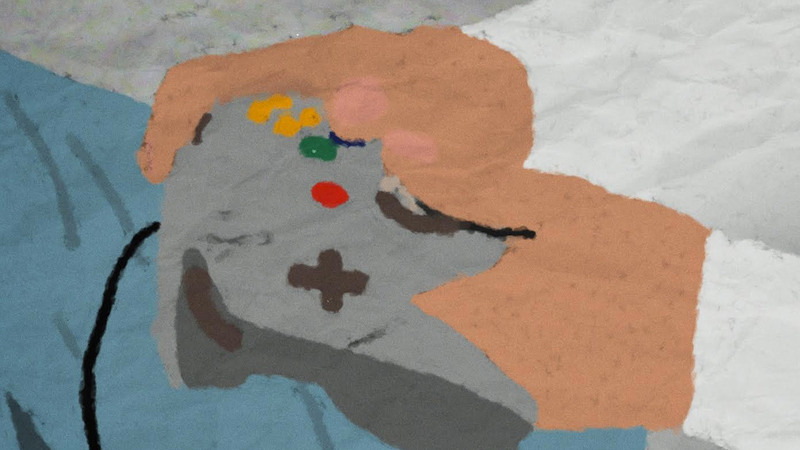 A short animation that explores the relationship that develops between two brothers of differing age growing up, and how video games foster that bond. An embrace of warm nostalgia, Zachary Antell’s thesis animation, Player Two, is an emotional exploration of both brotherhood and video games. Now, I don’t have a brother—my older sister inflicted barbies on me, not N64 cartridges. But, as a Nintendo-obsessed kid born in the 80s, it’s hard not to find this film relatable. With abstract imagery from Legend of Zelda: Ocarina of Time to Star Fox to Wave Race, Antell seems to be referencing a universal American childhood lexicon—Player Two feels familiar even if the specific relationships aren’t a direct mirror to your own. Player Two is undoubtedly sentimental—Antell aims directly at your heartstrings with every moment in this short. But, I’m sort of okay with that. While some may view the film’s emotional construction as a bit manipulative, I found it genuinely touching. I mean, how often do we get to see a good, healthy brotherly relationship depicted on screen? Moreover, it’s refreshing to see video games as things that bring people together, rather than isolate and distance them. Antell’s film is tranquil and comforting and the abstract, rotoscoped animation is lovingly constructed. Certain transitions really give the film a dynamic sense of aesthetics and simultaneously show a creative passage of time—of life being lived, of brothers growing older. I wish the voiceover was at times less flowery, but like a Cameron Crowe monologue that perhaps reaches a bit too far, it’s clear Player Two is coming from an honest, non-cynical place. The film is similar in concept to John Wikstrom’s short of the same name. But, it’s clear that when watching the two, both filmmakers take a similar conceit yet produce a different result. By using the rotoscope technique, Antell creates a dreamy vibe—like a memory being replayed in someone’s head. Each shot was filmed and then Antell would draw over it in photoshop (8 frames per second). The whole film was put together in After Effects for further finishing. Antell is no stranger to online success. His shot comparison for Star Wars: The Force Awakens and A New Hope has already went viral. And, considering its brief length and the subject matter of this film (video games and nostalgia? Has there ever been a short more tailor-made for the internet? ), we have no doubt Player Two will also prove to be popular online.